William Harold Lund (October 27, 1924 – September 27, 2008) was a former professional American football halfback who played two seasons for the Cleveland Browns in the All-America Football Conference (AAFC). Lund grew up in Cuyahoga Falls, Ohio and went to the Case School of Applied Science in Cleveland, Ohio. He was a star on his college football, basketball and track teams. He was a triple threat man in football, playing halfback and fullback. In track, he set a school record in the 100-yard dash and won the U.S. amateur championship in 1944 in the long jump. After a short stint in the U.S. Navy, Lund was drafted in 1945 by the Cleveland Rams of the National Football League. He signed instead to play for the Browns, a team under formation in the new AAFC. After two years with the Browns, in both of which the team won the AAFC championship, he was traded to the Chicago Rockets. Lund, however, elected to leave professional football to work as an engineer. He was later an assistant coach at Case, his alma mater. Lund grew up in Cuyahoga Falls, Ohio and played football briefly in high school. He graduated and attended the Case School of Applied Science in Cleveland, Ohio starting in 1942, playing on the school's football, basketball and track teams. As a sophomore in 1943 he became a primary halfback on Case's football team and was touted as an emerging triple threat man. Lund joined the U.S. Navy during World War II, but was allowed to stay at Case and study engineering as part of the Navy's V-12 training program. In the summer of 1944, he won the U.S. long jump title at the Amateur Athletic Union track and field championships in New York City. Lund set school records in the long jump, with 23 feet and 7 inches, and the 100-yard dash, with a time of 9.7 seconds. 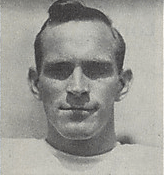 In the 1944 football season, Lund was moved from halfback to fullback. Later in the season, he became the team's primary passer while continuing to run the ball and kick. Lund was selected by the National Football League's Cleveland Rams with the 147th pick in the 1945 NFL Draft. Lund was still in the military in 1945, however, stationed at a base in San Diego, California and playing for the Fleet City Blue Jackets, a service team in San Diego. Upon his discharge in the summer of 1946, Lund signed with the Cleveland Browns, a team under formation in the new All-America Football Conference (AAFC). After injuries sidelined two of the team's starting halfbacks in 1946, head coach Paul Brown said Lund would be used more frequently. He got off to a strong start playing alongside fullback Marion Motley, the team's primary running threat. He suffered an ankle injury later in the season, however, as the Browns went on to win the 1946 AAFC championship. Lund got married in May 1947 to Nancy Ann Faris of Lorain, Ohio. He was introduced to his wife, a nurse, by teammate Robert Kolesar, who practiced medicine in the offseason. He also worked as an engineer in the offseason at Thompson Products, an aerospace and automotive conglomerate based in Euclid, Ohio. Near the beginning of the 1947 season, Lund broke his left thumb crashing into the stands after returning an interception for a touchdown against the AAFC's Brooklyn Dodgers. He missed three games and returned in October 1947. The Browns again won the AAFC championship that year. Before the beginning of the 1948 season, the Browns traded Lund and guard Joe Signaigo to the Chicago Rockets for guard Alex Agase and tackle Chubby Grigg. Lund did not play for the Rockets, however, quitting professional football to take a job as an engineer. Lou Saban, Lund's former teammate on the Browns, became Case's head football coach in 1950 and hired Lund to coach the freshman team. Lund later worked at Howmet Corporation in New Jersey and Cleveland's Sherwood Refractory. In 1979, he co-founded Concorde Castings, an aerospace components manufacturer, and was its chief executive officer until his retirement in 1995. Lund was a cousin of Pug Lund, a star at the University of Minnesota who was inducted into the College Football Hall of Fame. He died in 2008. 1 2 "Ban Lifted, Case Plays B.-W. Saturday". Cleveland Plain Dealer. February 8, 1943. p. 15. Carlin hopes that Bill Lund of Cuyahoga Falls may give him some badly needed help. The freshman played only briefly in high school, but has shown real promise at Case. ↑ "Sharer To Drill Case Trackmen". Cleveland Plain Dealer. April 8, 1943. p. 15. Bill Lund, freshman from Cuyahoga Falls, has times of 10.1 seconds in the century and 22.3 seconds in the 220. He has broad jumped 22 feet 8 inches. ↑ "New Case Ace". Cleveland Plain Dealer. June 9, 1944. p. 15. Bill Lund who starred on the gridiron and basketball court for Case, is continuing his brilliant work as a trackman. ↑ Zirin, Alex (September 23, 1943). "Pug Lund's Cousin Is Case Backfield Threat". Cleveland Plain Dealer. p. 14. There are ever increasing signs that Bill Lund soon will be one of the main cogs in the Case gridiron machine, even though it may not be on Saturday night when the Rough Riders open their season against B.-W. in Shaw Stadium. Coach Ray Ride has a lot of confidence in the sophomore tailback, who saw action only briefly last fall. When Bill does blossom out it will be as a full-fledged triple-threater. Thus far Ride is concentrating on making him a running threat and adding only a few kicking assignments. Before the season is much older Bill, a cousin of Minnesota's famed Pug Lund, will be running, kicking and passing. 1 2 3 4 5 6 7 Baranick, Alana (October 10, 2008). "Bill Lund, Cleveland Browns player, Concorde Castings CEO". Cleveland Plain Dealer. Archived from the original on October 6, 2012. Retrieved August 26, 2012. ↑ "Lund to Compete in National A.A.U. Meet". Cleveland Plain Dealer. June 13, 1944. p. 14. Bill Lund, Case's star broad jumper, yesterday received his navy V-12 leave to compete in the National A.A.U. meet in New York Saturday and Sunday. ↑ "Case's Bill Lund Snares U.S. Broad Jump Title". Cleveland Plain Dealer. June 19, 1944. p. 12. ↑ Nichols, William (December 7, 1966). "College Notes". Cleveland Plain Dealer. p. 66. ↑ "Bill Lund NFL Football Statistics". Pro-Football-Reference.com. Retrieved August 5, 2012. ↑ Piascik 2007, p. 45. ↑ Piascik 2007, pp. 45, 81. ↑ Sauerbrei, Harold (November 8, 1946). "Blandin Replaces Daniell as Starting Tackle for Browns". Cleveland Plain Dealer. p. 21. ↑ "Browns Boost Western Lead to Two Games, Whip 49ers, 14-7". Cleveland Plain Dealer. November 11, 1946. p. 16. Frail-looking Bill Lund, the 178-pound halfback who has been inconspicuous as a Cleveland pro football player this season, and Marion Motley, who has had both good and bad afternoons, today made a winning team of the Browns again. ... After getting the Clevelanders away to the 14-point lead, both Lund and Motley left the game with injuries. Bill turned his ankle late in the first quarter and didn't return to the field. 1 2 "Browns' Lund Marries in May". Cleveland Plain Dealer. April 2, 1947. p. 20. ↑ "Broken Thumb Shelves Lund". Cleveland Plain Dealer. September 16, 1947. The Cleveland Browns' troubles at left halfback continued to mount yesterday when it was learned that Bill Lund had suffered a broken left thumb in the victory over Brooklyn last Friday night. The injury occurred when Lund crashed into the stands while scoring a touchdown following a pass interception. ↑ Sauerbrei, Harold (October 7, 1947). "Dons Menace Browns' 11-Game Victory Streak". Cleveland Plain Dealer. To take up some of the slack at left half, Brown expects the return of Bill Lund, who has been out of the last three games because of the broken left thumb ... The cast has been removed from Lund's thumb and he'll be ready for part-time action. ↑ "Browns Get Agase in Trade for Lund". Cleveland Plain Dealer. May 22, 1948. p. 18. ↑ Cobbledick, Gordon (August 10, 1948). "Plain Dealing". Cleveland Plain Dealer. p. 18. Bill Lund, the Case grad who quit the pro game after two seasons with the Browns, visited his ex-mates in Bowling Green last week. He has taken an engineering job at Tapco. ↑ Sauerbrei, Harold (August 3, 1943). "Ride Finds Only One Experienced Gridder in New Navy Group". Cleveland Plain Dealer. p. 13. Bill Lund, the latter a relative of Minnesota's great Pug Lund of a decade ago.